I usually get up super early in the morning. I don’t really like sleeping and when I have a couple of hours downtime in the morning, the rest of the day just seems less stressful. Even though I’m usually up, it’s still a struggle to actually make and eat breakfast. Sometimes I’m just not hungry or sometimes I don’t want to be standing at the stove or doing dishes, you know? Maybe I should stop trying to push myself to eat breakfast. Does anyone have any experience with Intermittent Fasting? (Click here for Nerd Fitness’s Beginner’s Guide to Intermittent Fasting if you’ve never heard of it before.) 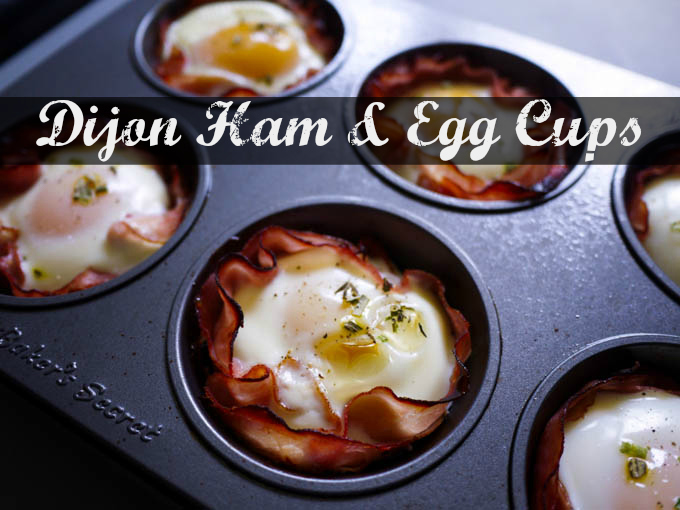 Until then, I’m always looking for quick things I can make over the weekend and grab out of the fridge when I do feel like breakfast. I’ve seen versions of this recipe all over the place and many of them just seemed to be missing something. They looked like they needed more flava! I wanted to add some strong flavor without having to cook additional ingredients. Then it hit me! Mustard! 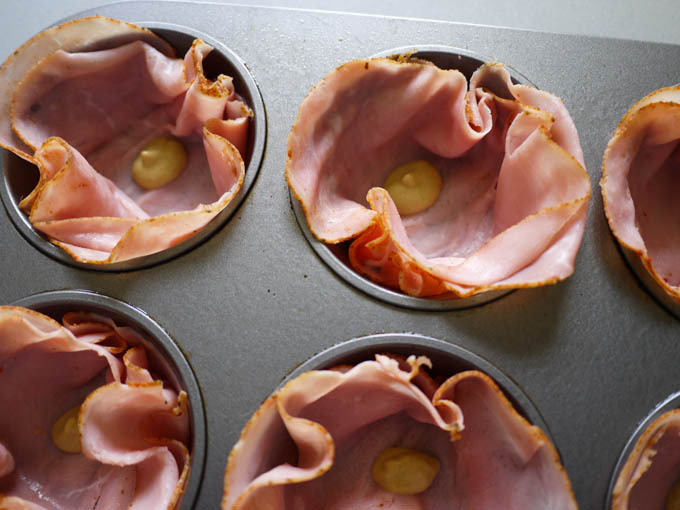 Mustard and ham go hand-in-hand. It adds a nice kick without a lot of extra work. 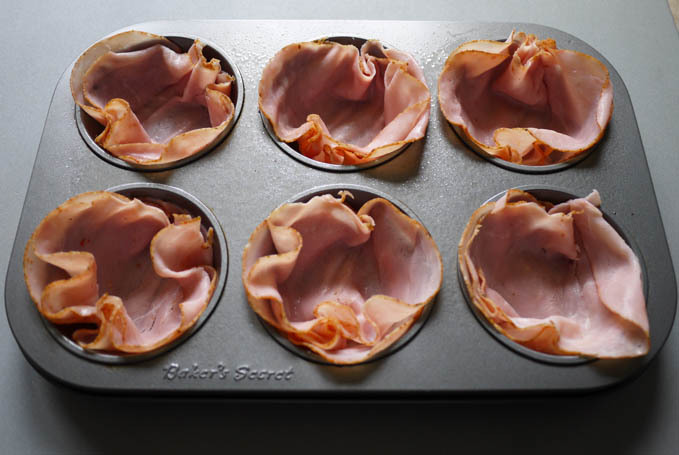 Spray your muffin tin with nonstick spray. Layer 2 slices of ultra-thin ham in each compartment. 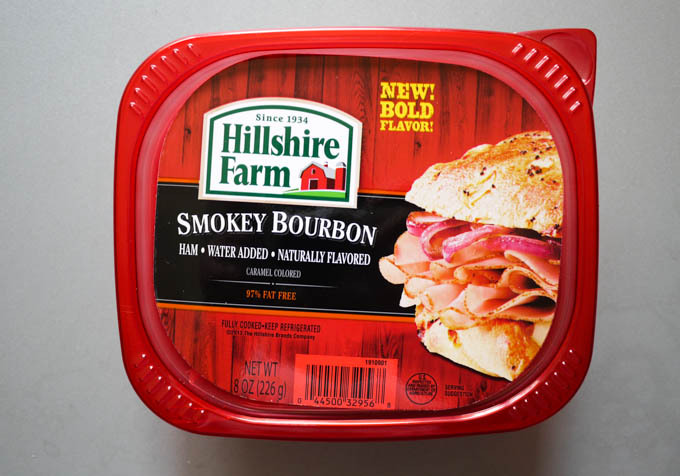 I’m using this Hillshire Farm Smokey Bourbon Ham I found at Harris Teeter because I have a compulsion to buy anything marked “New!” (and because, come on, “smokey bourbon ham” sounds like a little bit of alright). Squeeze a small amount of dijon mustard onto the ham in each section. 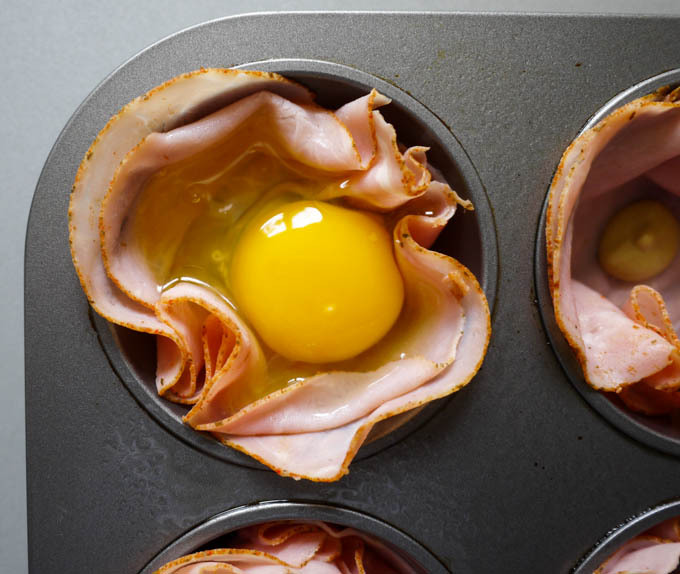 Gently crack an egg on top of the mustard, trying to keep the egg inside the ham slices. Top the egg with a sprinkle of dried chives. 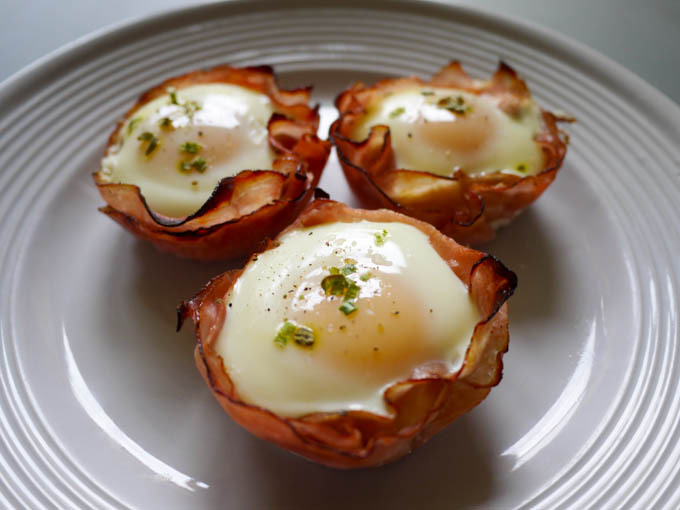 Bake for approximately 12 minutes (for runny yolks), 15 minutes (for slightly runny yolks, shown below), or 18 minutes (for firm yolks). 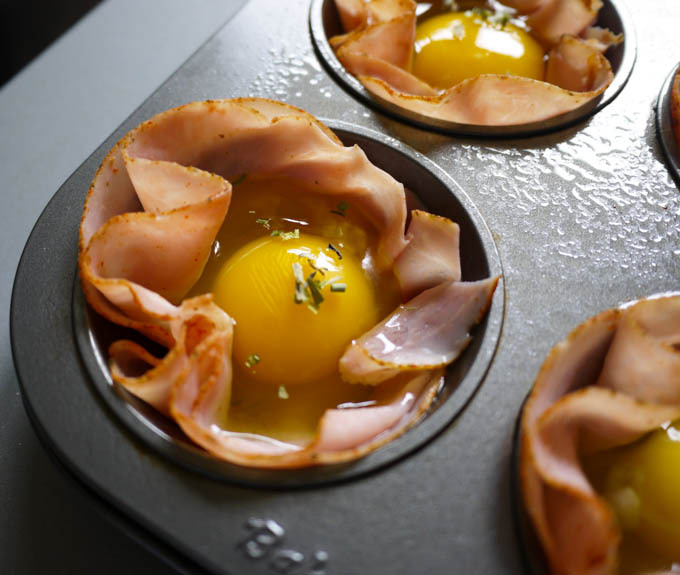 Gently baked eggs with a base of thinly sliced ham and tangy dijon mustard. Gently crack an egg on top of the mustard. I kind of love that we both used ham & mustard in our recipes today 🙂 They totally do go hand-in-hand! 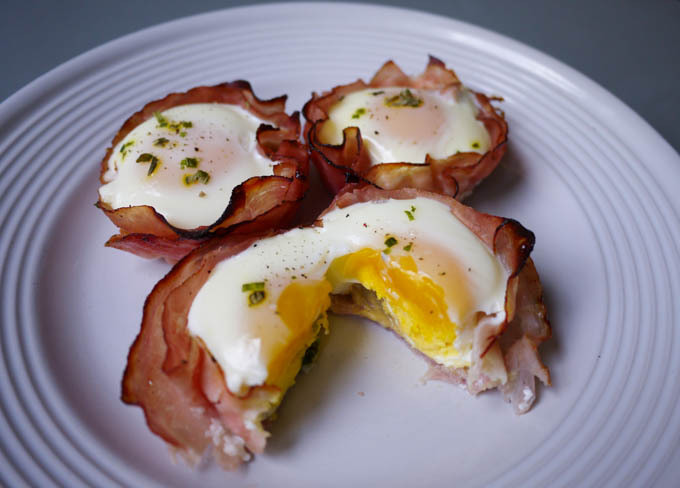 These look SO good – I love ham and eggs in the morning, so I definitely need to try this! And can I say that that smokey bourbon ham looks amazing? I need to run by my HT and see if they have it! 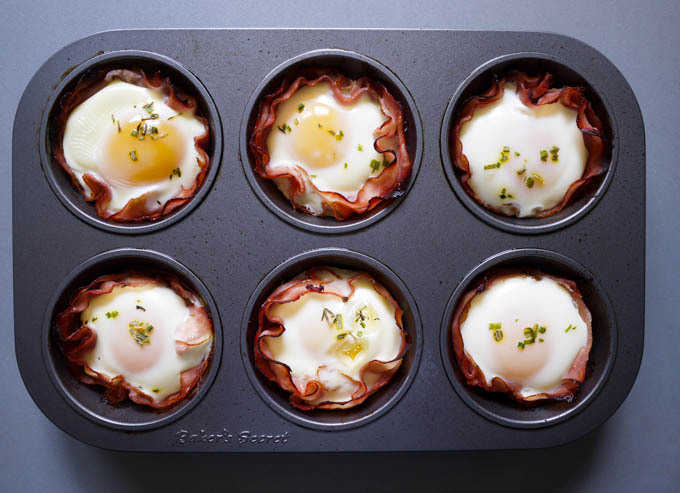 I really like the idea of baking eggs in a muffin pan! These look adorable. I love this kind of post! Thank you. I think there’s an assumption out there that ppolee just already know somehow by osmosis how to do something like hard boil an egg. I never knew! I seriously don’t think I have ever hard boiled an egg because I really wasn’t sure how long to cook them.